Naza Automotive Manaufacturing Sdn Bhd will be rolling out two new non-KIA models in the next two months. Codenames, NX-01 and NX-02, they will be built at Naza’s plants in Gurun and Pekan respectively. Naza hinted at some details of the two models. The NX-01 will be a small 1.1 litre car in the Perodua Myvi range. It will be priced between RM30,000 to RM40,000. Naza says the model was originally designed by Pinanfarina but Naza’s own team had made some changes to the design to suit local market tastes and to have an identity of it’s own. These little hints seem to point to the Hafei Lobo 1.1, a Chinese car designed by Pininfarina. Check out this link for more details on the car. Launch date is scheduled to be on the 22nd of April 2006. Update: See Naza NX-01 Spyshots! The other car, codenamed NX-02, would be launched in May. It will be priced between RM65,000 and RM75,000. Not much details on this have been revealed by Naza, but it would most probably be the Naza-badged Peugeot 206 which was announced September 2005. 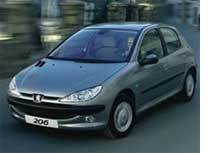 The Peugeot 206 has since been phased out by the hot new Peugeot 207, but it still looks good. The model introduced would likely be the 1.4 litre SOHC 8 valve model.